Israeli forces stormed, on Monday morning, the village of Khirbet Abziq, east of Tubas in the northern Jordan Valley, and seized two agricultural tractors while abusing Palestinian citizens. 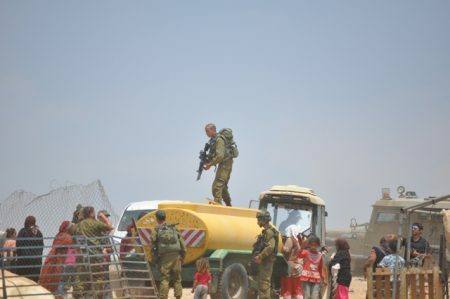 Witnesses said, according to Al Ray, that Israeli soldiers broke into AL-Madareb, in Khirbet Abziq, and seized two agricultural tractors belonging to Fayez Nghneghya and Nemr Horoub, and took them to a nearby military camp. They pointed out that the seizure happened repeatedly, in an attempt to harass citizens and force them to leave Khirbet Abziq. More than two dozens of tractors were confiscated in different areas of the Jordan Valley, over recent months. It is noteworthy that dozens of citizens living in Khirbet Abziq, mostly refugees from the pre-1948 occupied territories, are being deprived of many basic essential services under Israeli policies. The tractors are used for agriculture and water transference.